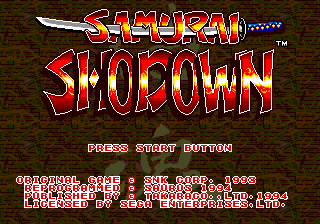 Samurai Shodown, known as Samurai Spirits (サムライスピリッツ) in Japan, is a versus fighting game by SNK, originally developed for Neo Geo AES/MVS hardware. It is the first in the series, and is notable for using weapons rather than relying on hand-to-hand combat during battles - one of the first fighting games of its type to do so. After being released for the Neo Geo in 1993, ports were made to a variety of platforms, including the Sega Mega Drive, Sega Mega-CD and Sega Game Gear. Translated by: Saurus Co., Ltd. Presented by: Takara Co., Ltd.
Main article: Samurai Shodown/Magazine articles. Main article: Samurai Shodown/Promotional material.